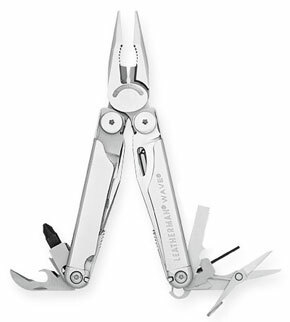 You should never hike or backpack without a multi-use tool even if you are out on the trail for only a couple of hours. You never know when you will need one for repairs or just to remove a splinter from your hand. You have several options to consider: a knife or a multi-use tool. Purchase the best multi-tool or knife that you can afford as you won't regret spending the extra money. Someday, one of the features will make a big difference on the trail. Some knives and multi-use tools are heavy and bulky so choose the lightest/smallest tool that will fit your needs. The multi-use tool has an assortment of features that allow you to repair and handle the toughest of jobs. The tool can saw wood as well as repair with the plier, screwdrivers and other features. If you are on the trail for any extended period of time and you might need tough repairs, the multi-tool is the correct choice. A kayaking day trip should include a multi-use tool. All Purpose Knives: The Swiss Army style knives have a lot of features in a small, compact tool. The knives are usually heavy and have toothpicks, knives, screwdrivers, scissors, pliers, etc. There are many models to choose from and each model is dedicated to a specific outdoor adventure. I carry the Swiss Army knife while kayaking and backpacking. The folding knife is a knife that folds away to protect the blade. It is an easier knife to pack than the straight knives. Make sure the knife closes tightly and doesn't have a chance to open up on its own. The straight knife can't fold away and is only used as a knife. There are no other features available. I use a straight knife attached in front on my PFD while kayaking. The straight knife can readily be pulled out of the holder and used to cut deck rigging, etc. that I might become tangled with. The straight knife should have a holder when placed in a backpack. Figure out what you will need based on your hiking or kayaking plans and purchase no less. You won't regret it. Don't forget to learn how to maintain multi-use tool correctly because incorrect methods might damage your multi-purpose tool and choose your multi-purpose tool wisely.